If you chose option (2) then you will need to transition your business from the startup phase, in which most major business functions are performed by you, or small team around you, into Scale Up mode. This means implementing new systems to make your business operations more efficient and reliable, finding new marketing and distribution channels to boost sales and exploiting all of the growth opportunities within your business. How to prepare your business for scaling up and systemise it for more efficient and reliable operations. 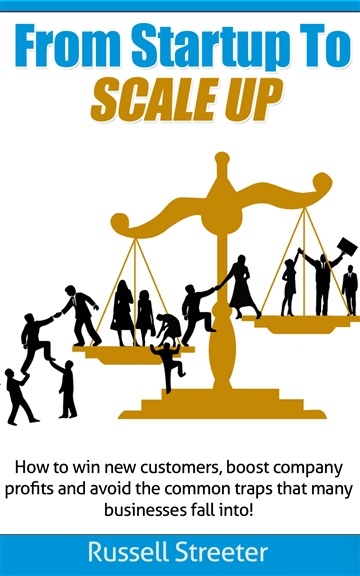 •	How to win new customers and expand your business into new markets. How to leverage your existing customer base in order to develop consistent sales and profits and build long-term business value. The book gives you easy to use growth models including the Seven Keys Formula, the Business Growth Calculator and the Lead Generation Engine, as well as list of 99 lead generation tools for you to choose from. And to supplement the book, Russell has developed a free online training module with videos and downloadable templates that you can access anywhere, anytime.